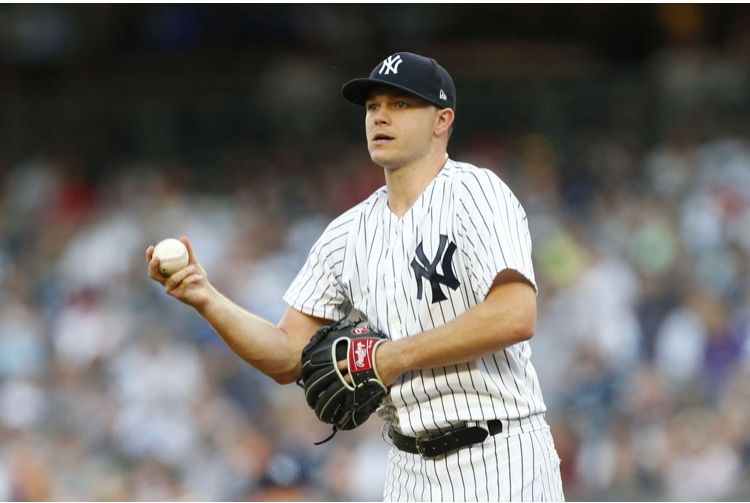 Yankees General Manager Brian Cashman made it clear in October when the offseason commenced that he would move struggling starter Sonny Gray, and on Monday afternoon, he finally did. Gray was sent to the Cincinnati Reds, along with left-handed pitcher Reiver Sanmartin, for second baseman Shed Long and a Competitive Balance Round A pick in the 2019 MLB First-Year Player Draft. Long was then sent from the Yankees to the Seattle Mariners foroutfielder Josh Stowers. The fact that the Yankees have now traded Gray means that the Yankees' rotation will be Masahiro Tanaka, Luis Severino, James Paxton, J.A. Happ, and CC Sabathia, and no obvious pitcher ready to go if anyone gets injured aside from Luis Cessa or Jordan Montgomery, who is recovering from Tommy John surgery. The Yankees vowed to address the starting rotation in the offseason, and it is questionable if the addition of Paxton from the Mariners in November is enough to push them past the defending champion Red Sox. In the few weeks left before spring training, it is an absolute must that they add one or two more reliable starters since Sabathia had heart surgery in December and all of their starters have injury histories. In this day and age in baseball, teams realistically need seven or eight pitchers available to jump in and start. Cessa has not proven to be a reliable starter in his three years with the Yankees, and Domingo German and Jonathan Loaisiga do not have the experience to jump into a rotation for a contending team. Josh Stowers could prove to be a valuable piece in the outfield if Brett Gardner continues to decline and Clint Frasier does not return back to what he was before suffering multiple concussions. Stowers, 21, made his professional debut in 2018 and hit .260/.380/.410 (52-for-200) with 32R, 15 doubles, 5HR, 28RBI, 37BB and 20SB in 58 games with short-season Single-A Everett. His 20SB were tied for second in the Mariners system and tied for the third-most in the Northwest League. The right-handed batter was named a Northwest League Mid-Season All-Star and was tabbed the No. 12 prospect in the Northwest League by Baseball America. Following the season, he was also named by Baseball America as the No. 10 prospect in the Mariners organization. The Chicago, Ill., native was originally selected by the Mariners in the second round of the 2018 First-Year Player Draft out of the University of Louisville. Gray, 29, went 11-9 with a 4.90 ERA (130.1IP, 71ER) in 30 games (23 starts) for the Yankees in 2018. He posted a 15-16 record and a 4.51 ERA (195.2IP, 98ER) in 41 games (34 starts) in two seasons for the Yankees (2017-18). The right-hander joined the Yankees in a four-player trade from the Oakland Athletics on July 31, 2017. Sanmartín, 22, pitched at four levels in the Yankees organization in 2018, combining to go 5-7 with a 2.81 ERA (67.1IP, 65H, 29R/21ER, 4BB, 58K, 2HR) and one save in 13 games (10 starts) between Double-A Trenton, short-season Single-A Staten Island, Single-A Charleston and Single-A Tampa. He was acquired by the Yankees from the Texas Rangers in exchange for RHP Ronald Herrera on November 20, 2017. Long, 23, hit .261/.353/.412 (118-for-452) with 75R, 22 doubles, 5 triples, 12HR, 56RBI, 57BB and 19SB in 126 games for Double-A Pensacola, where he was named a 2018 Southern League Mid-Season All-Star. He also played for Scottsdale in the Arizona Fall League and participated in the league’s Rising Stars Game. Following the 2018 season, the left-handed hitter was ranked as the No. 7 prospect in the Reds organization by Baseball America. A native of Birmingham, Ala., Long is a career .272/.353/.435 (445-for-1,635) hitter with 231R, 86 doubles, 15 triples, 50HR, 211RBI, 188BB and 54SB in 457 minor league games. He began his career as a catcher before converting to an infielder prior to the 2015 season. Long was originally selected by the Reds in the 12th round of the 2013 First-Year Player Draft.